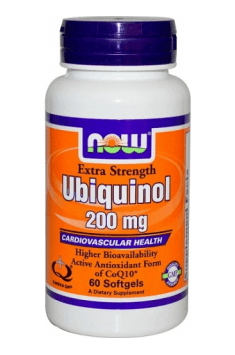 Ubiquinol – new, highly bioavailable coenzyme Q10 form! Coenzyme Q10 (also called ubichinone), is an organic vitamin-like substance, which is naturally produced in most of living organismes. It’s second name – ubichinone – means, that is very common in every organism structure. Coenzyme Q10 plays very imporant role in energy production inside our organism. The reason for this, is that coenzyme is basic component of mitochondria, where it take part in fats and carbohydratesmetabolism, and cell membrane. It’s also used in some enzymatic processes, where it take part in ATP creation, and energy transfer between cells. In short way – your organism couldn’t do anything without coenzyme Q10. What are benefits of supplementing coenzyme Q10? Why coenzyme should be considered for supplementation, for everyone in their thirties? Coenzyme Q10 is necessary for proper fats and carbohydrates conersion to energy, but natural production of coenzyme is highly decreased with age. When your body have proper amounts of coenzyme in mitochondria, they can be much more effective in whole body. Coenzyme Q10 is also strong antioxidant. It is protecting proteins, fats and DNA of mitochondria from oxidation, and it supports overall mitochondrial actions. Why ubiquinol, and not ubichinone? Ubchinone, not only that is poorly absorbed in bloodstream, but it also need to be converted to ubiquinol then. That’s because ubiquinol is only form, which can be effective used by our organism. As it can be seen, it’s very complicated and long process. Because ubiquinol is already active form of coenzyme Q10, it’s fastly absorbed in bloodstream, because there is no “brake” in form of need of conversion one substance to another before absorption. It’s absorbed more easily, and it stays in bloodstream longer. Enchance your health with ubiquinone even today!